With mumps cases on the rise, some Ohio State students are heading to the campus health center. OSU’s interim president, meanwhile, said the university is forming a group to better handle future outbreaks. Student Health Services interim director John Ford said there have been an increased number of students going to the Wilce Student Health Center because of the mumps outbreak, according to a Monday email from Student Life spokesman Dave Isaacs. The email also said 18 students have received at least one dose of the mumps, measles and rubella vaccine since Feb. 1. OSU students interested in the MMR vaccine are able to receive one through health services after a screening. 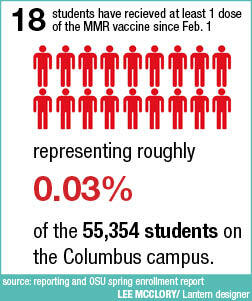 An MMR immunization costs $124, according to the OSU Student Health Services website. Columbus Public Health has encouraged anyone who has not received two doses of the MMR vaccine to get vaccinated, but Jose Rodriguez, spokesman for Columbus Public Health, said in March those who have received two doses of the MMR vaccine still have a 10 to 20 percent chance of being infected. As of Monday afternoon, 111 mumps cases had been reported in Franklin County, eight more than Friday’s count. Eighty-nine of the 111 cases were linked to the OSU outbreak, with 72 OSU students, nine OSU staff, seven people with OSU links and one family member of someone with OSU ties affected, according to a Columbus Public Health release. Alutto said the outbreak isn’t out of the norm, but the university is responding to it. “It seems to be following the normal pattern that we see for these kinds of outbreaks, you can never stop it,” he said in an interview with The Lantern Monday. “We as an institution need to think more carefully about what we can do. Now an outbreak has occurred, you can try very easily to keep people apart, but there’s a limit to what you can do in that regard, so I think we need to learn from this because there’ll be other problems with infectious diseases. Alutto said OSU is also working with authorities about how to better handle the situation. “We’re working really closely with all kinds of health authorities and trying to examine more carefully how we’re approaching the treatment of all infectious diseases on campus and what we need to do to keep students as safe as possible,” he said. Haleigh Monaco, a third-year in chemistry, said having to worry about the mumps is strange to her. Monaco said she didn’t know OSU offered MMR vaccines. She said she hasn’t heard much about the outbreak from OSU since Alutto sent an email to students, faculty and staff March 6 warning the community about the reported cases. Jake Geers, a second-year in political science, said while it’s good people are staying informed about the outbreak, he thinks it’s being blown out of proportion. He said OSU’s group looking at the handling of the outbreak should incorporate a variety of voices from students, faculty and staff. “My suggestion would be to get feedback from a wide array of people,” Geers said. Other university officials have taken action to help slow the outbreak as well — OSU Provost and Executive Vice President Joseph Steinmetz sent an email to faculty and staff March 19 asking them to support anyone affected by the outbreak. “The recent outbreak of mumps on the Columbus campus has all of us concerned. While relatively few students have been affected, any number is too large, and the university is taking precautions to ensure that the outbreak is controlled as rapidly as possible,” Steinmetz said. “Those precautions include Student Health Services and Columbus Public Health’s urging students who have fallen ill with mumps to stay home and avoid school, work and other public settings for five days after their symptoms appear. This request means that affected students will be unable to attend school, perhaps for several days. Alutto said outbreaks like the mumps can lead to a sense of nervousness around campus. He said it’s comparable to if an OSU community member’s family gets the flu. Being a staff member at OSU, I certainly would love to hear where the nine infected staff members work. This article is misleading because the CDC only recommends 2 doses of the mmr vaccine and American children are required to prove when they are in the k-12 system that they have received their two doses of mmr so the majority of current student are vaccinated and are not recommended to get a third dose.